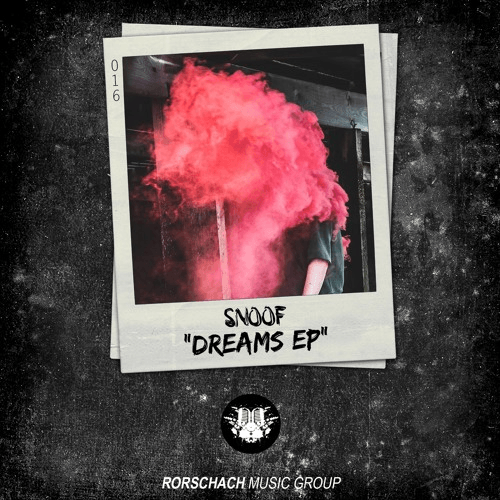 SNOOF’s Dreams EP Is Out In Stores Now! The homie SNOOF is here with the full release of his long-awaited Dreams EP. Featuring several Rorschach members, the EP is a short but commanding burst of bass music that further adds to the unique sound the RMG team has worked so hard to curate. “WARNING,” the EP’s lead single, features Mikey Ceaser and works well to establish the heavy trap/rap hybrid sound of Dreams. Gritty bass combine well with SNOOF’s simple synth work to create a dark and aggressive environment, a testament to the artist’s sound design and overall talents in the studio. “MOVIN” features RMG vet Jroll and rapper Ill Nicky, maintaining the trap/rap sound while adding some future bass flair. “T’D UP” with Malcolm Flex and Rawk Miller brings things back to that aggressive environment “WARNING” worked to establish. Pounding 808’s and eccentric, high-pitched synths combine for a sound ready to smash any festival crowd. Be sure to support the release with a listen or purchase through any of the links below! This site was crafted with love by Eric Mitchell Audio. © Copyright Greg Gatsby 2017. All Rights Reserved.